The Signicade is 25"w x 45"h and it has a 24"x 36" sign area. You can easily display a sign on EACH SIDE of the stand. 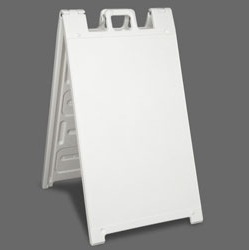 This sign holds up well outdoors and weighing in at 18 lbs, isn't known for tipping over. The frame may also be internally ballasted with sand for some extra weight and being constructed of high density plastic it can take a lot of abuse. The nicest thing about it though, is how easy it is to change custom printed panels (add'l option) to keep up with your business' needs. Most Popular - Our Best Seller! Overall A Frame sign height: 45"